Cathy’s weekly challenge In A Vase On Monday offers an opportunity to create a floral arrangement from materials gathered in one’s own garden. My irises have been especially enjoyable this spring and I have already posted several times to highlight them. This week, guess what? 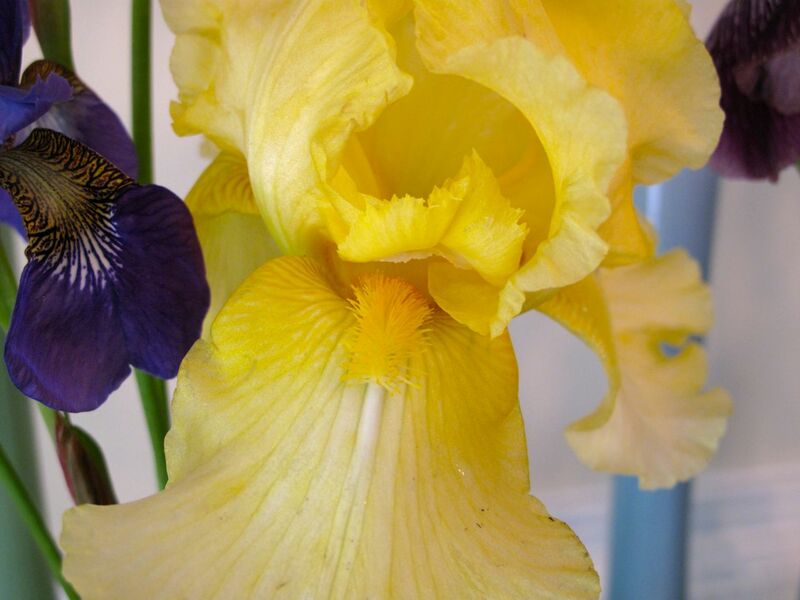 Irises are in my vases this Monday. 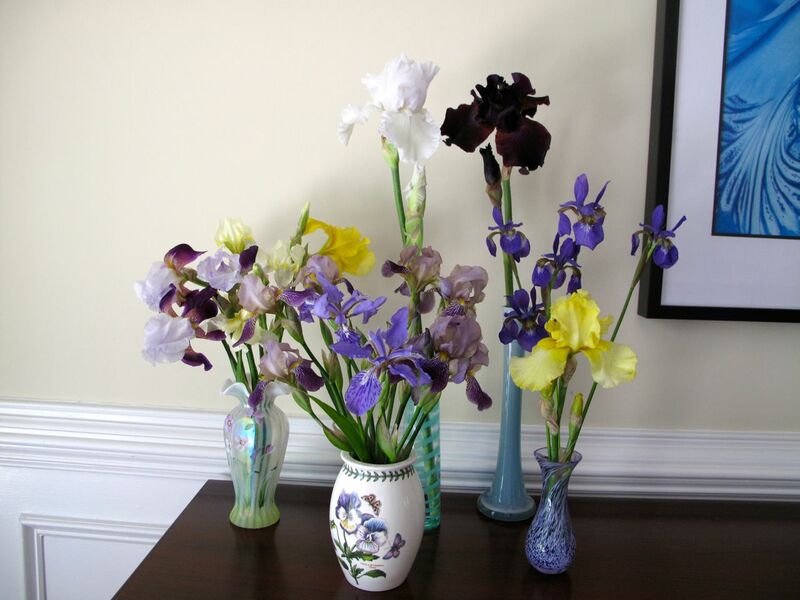 My concept this week was to select as many of the various irises as possible this morning and simply place them all in a big glass vase the way I saw my maternal grandmother do many times. The irises I gathered this morning were of such varying widths and heights it was easier to divide them among several containers. 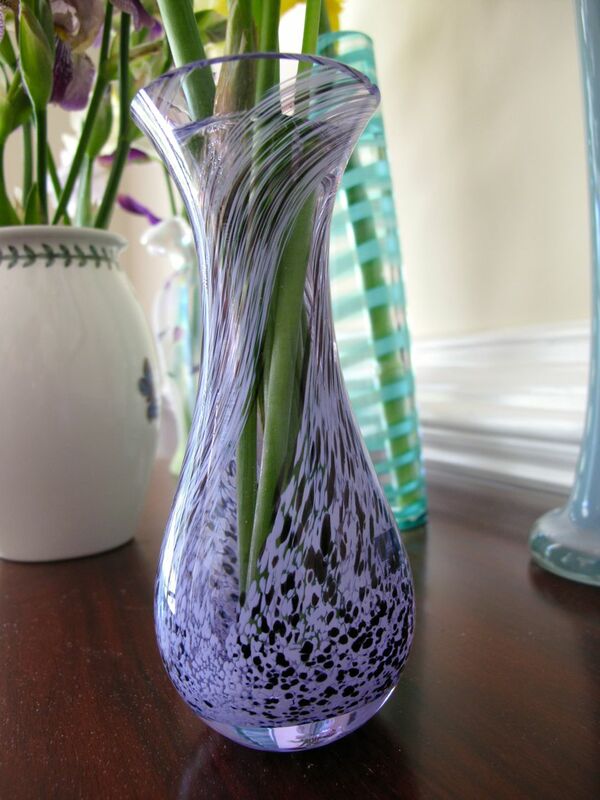 I used an assortment of vases, first choosing my purple-hued ones. My sisters have supplied me with interesting vases through the years. 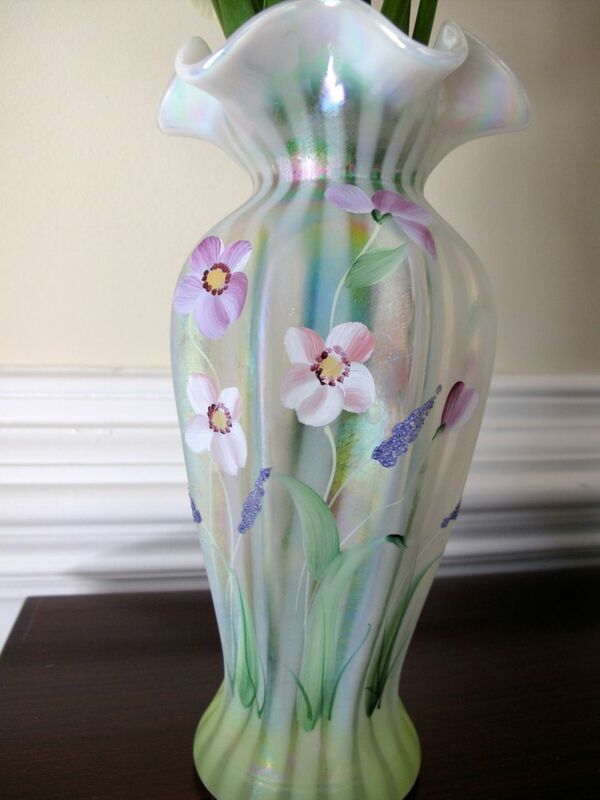 This Portmerion botanic vase made in England is quite versatile and lovely. I did not go on the trip to Scotland and Ireland my sisters enjoyed so much, but this is much better than a t-shirt. 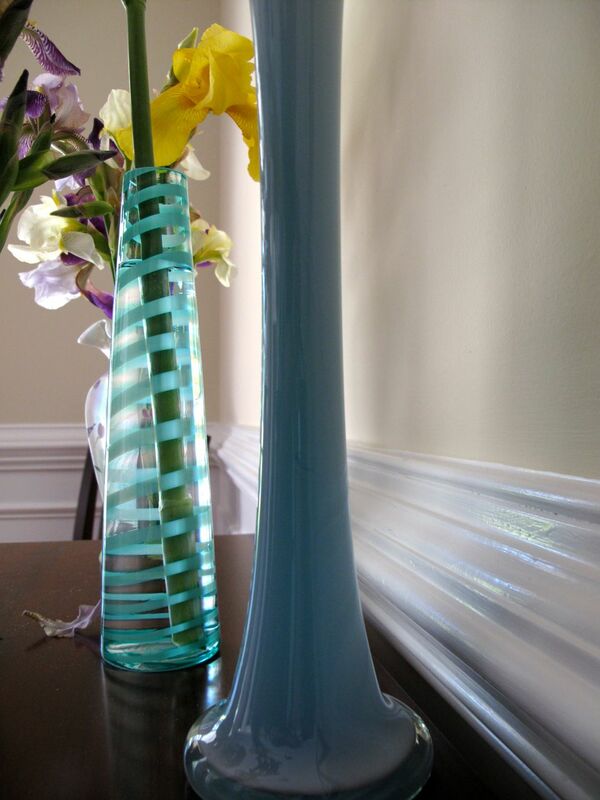 This glass vase is very heavy and looks great with pink or white roses and lavender. It was perfect for a few irises today too. 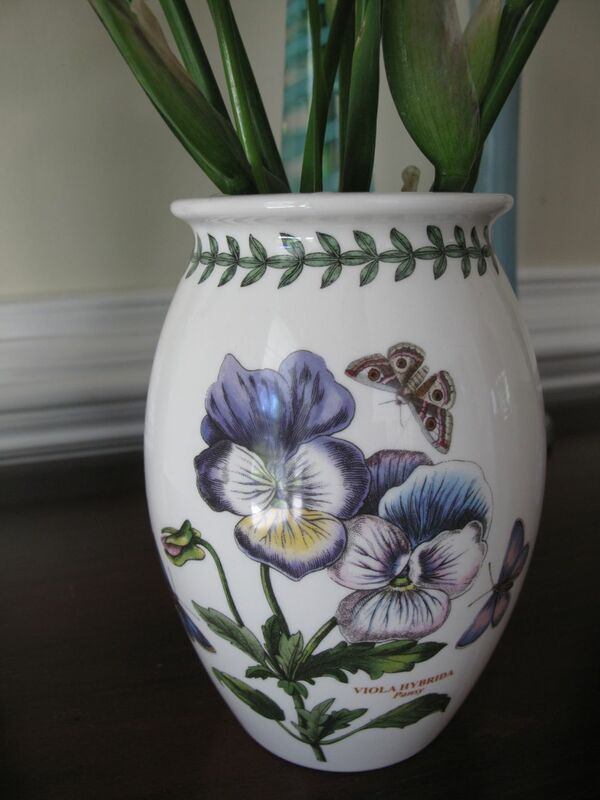 With yet more irises to display I went looking for the hand painted Fenton Glass vase. I still needed a couple more very tall vases and settled on these. 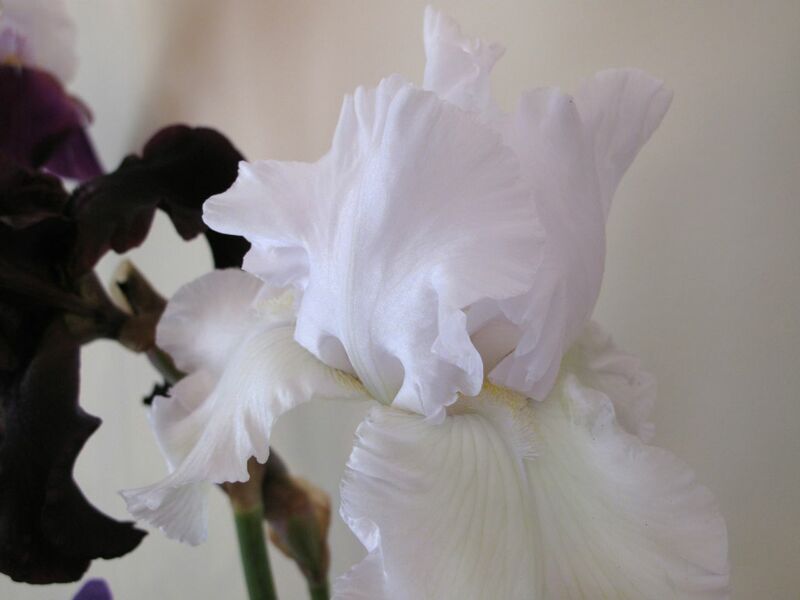 With huge, showy flowers both the nearly black iris and the white ‘Immortality’ grow on very strong thick stems and required very tall sturdy containers for support. 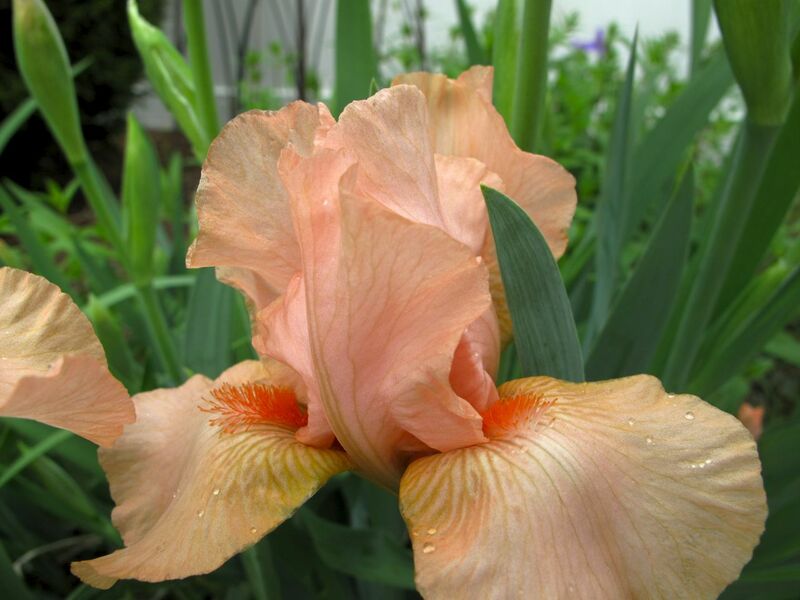 Most of my irises are pass-alongs and as such, I have not selected them myself for style and color—I would like to seek out some special colors. But I have always enjoyed blue/violet flowers. 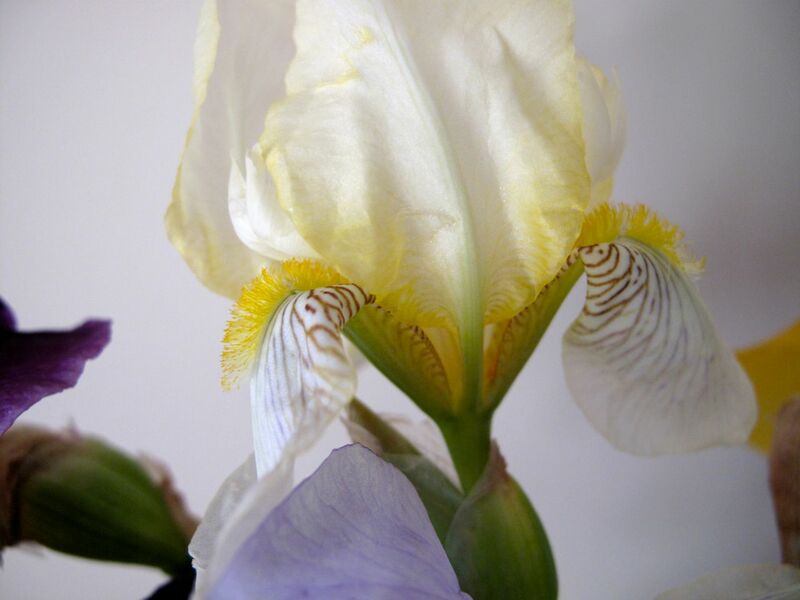 One of the latest iris to bloom that I have not written about this year is the pale yellow Japanese Iris my sister-in-law gave me from her home in Idaho. I carried this iris with me we we moved to this new garden. 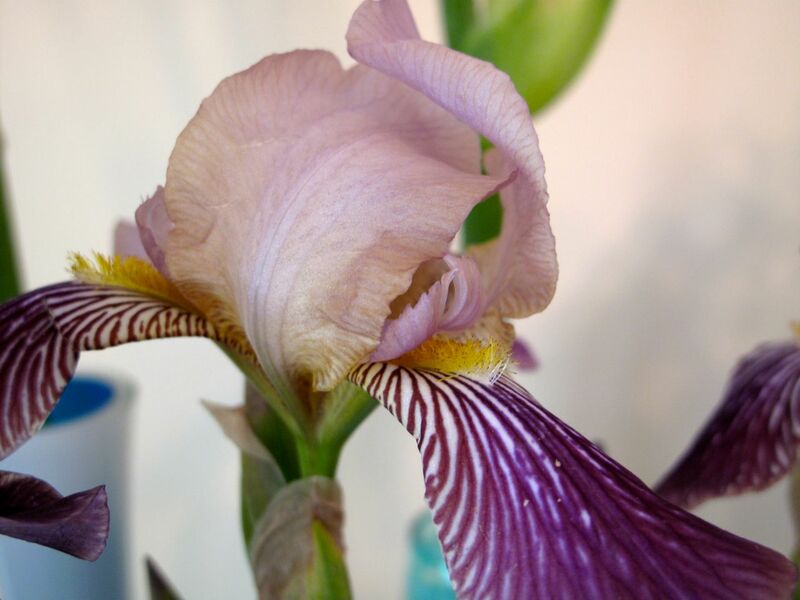 The Siberian Iris is another passalong from a friend who salvaged it from one of her neighbors (along with Japanese Roof Iris). It had become hidden by an evergreen. When the tree died a couple of years ago I rediscovered it and am moving it to different parts of the garden. 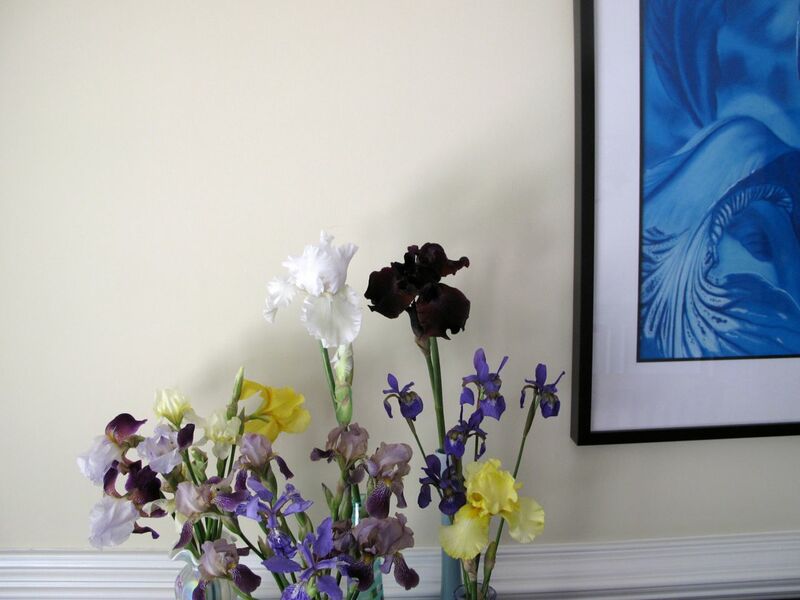 The Siberian Iris is also the inspiration for the pastel drawing hanging in the dining room. It was created by our son-in-law in 2009. I did not get a good photograph of it today without reflections, but will try to share it another time. This bright yellow bearded iris came from a neighbor during last year’s plant exchange. I like its clear, clean color. Some other irises that friends gave me regrettably did not make it through the winter. I think I did not get them planted in time for them to be established well. Here is one more passalong from my former neighbor Henrietta. There is a large stand of these that has recently opened. For the sake of documenting bloom times, I will add I was able to find at least one stem of all the irises in my garden, except for these that are finished blooming: Dutch Iris, Iris germanica ‘Batik’, Iris germanica ‘Raspberry Blush’ and a passalong Tall Bearded Iris. It is fun to gather flowers to enjoy indoors. A big thank you to Cathy at Rambling In The Garden for hosting each week. Visit with her to see what she and others are placing In A Vase On Monday. This entry was posted in garden and tagged flower arranging, flower design, in a vase on monday, iris, nature photography on May 12, 2014 by pbmgarden. Beautiful idea and vases…my miniature irises are coming up…I should just go and pick what flips my skirt for the morning and put them in a vase. Thanks Donna. Yes, give it a go. Your Iris all look beautiful. I particularly like the reddish black and the yellow ones. Although I’ve had a few bloom here and there, it looks as though most of mine may take a pass again this year. They’re not overcrowded or buried too deep – I’m wondering if the failure to bloom may be a by-product of the lack of winter rain last year and this one. Thanks Kris. 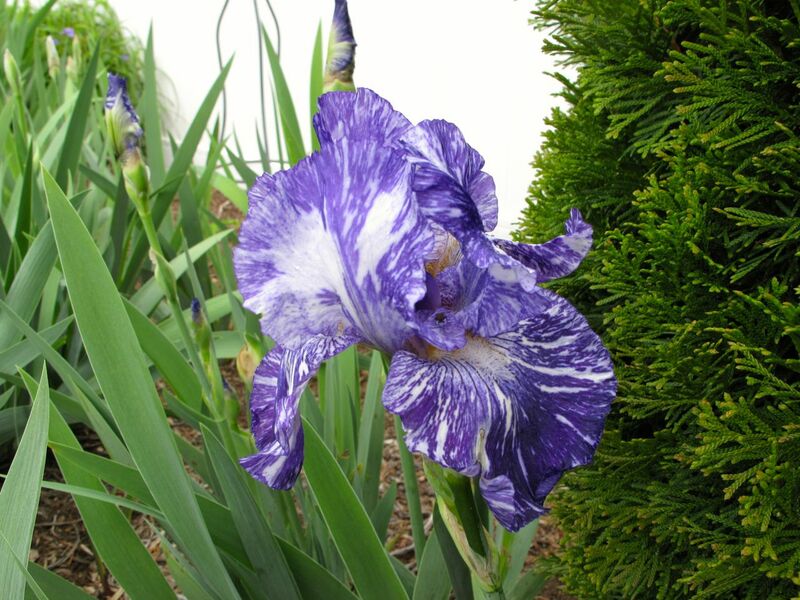 It’s a shame to miss out on your iris blooms again this year. I don’t know what the remedy might be for that but you might try moving a few to a different spot. We had so much rain this winter I was worried about irises and other plants standing in water. It’s dried up quickly though now. Beautiful irises and such pretty vases too. 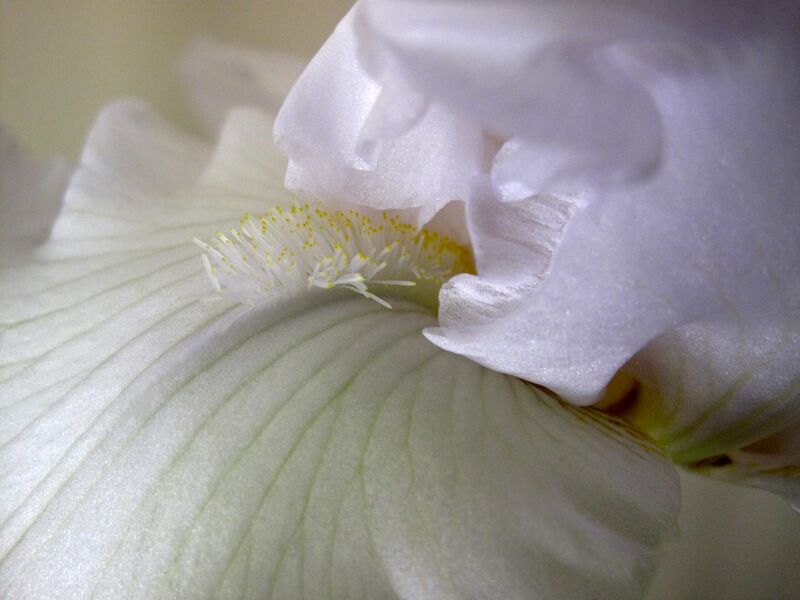 I think you are gradually becoming a collector of irises…? 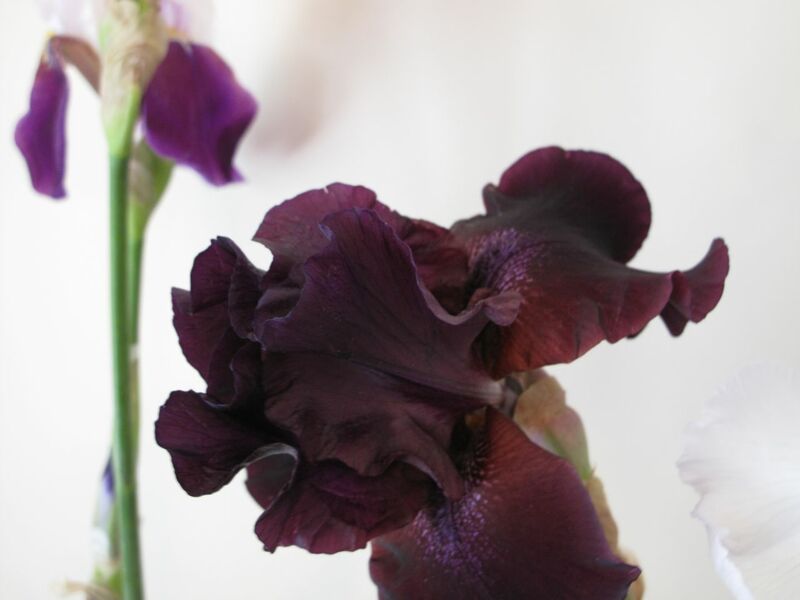 I particularly like the dark yellow bearded iris, and the last photo of ‘Immortality’ is wonderful too! Thanks Cathy. I didn’t realize until this spring how many different irises have found their way into my garden, mostly given to me and not purchased. It’s hard to turn them down. 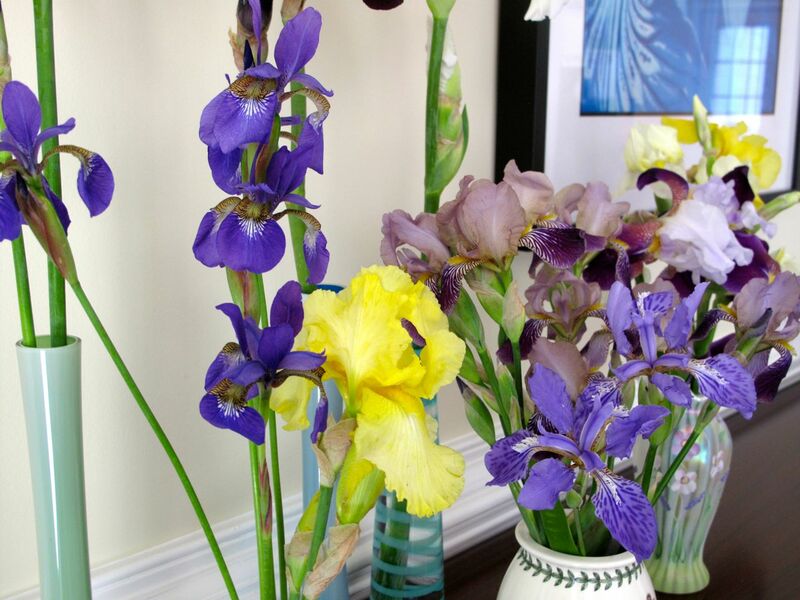 What a lovely way to display your collection of irises Susie. Your ‘Immortality’ definately looks a slightly different white to mine, maybe it is due to soil conditions. I am beginning to realise I need to increase my collection of vases, you have some many lovely ones. Thanks Christina. The vases are nice to have for this Monday vase adventure. Your silver one is certainly special. Perhaps I shouldn’t call my iris ‘Immortality’ because it came as a passalong without a name and I deduced it was ‘Immortality’. I bought my ‘immortality’ from a nursery here so it could easily be miss-named. I think yours is much more beautiful! Absolutely stunning! You obviously share my passion for Irises. You have some gorgeous ones. I love your little vases. By coincidence I was at Port Meirion where your little vase came from yesterday. I bought a lovely jug. It is an amazing place, quite unlike anywhere else. Thanks so much Chloris. Irises are certainly rewarding to grow. I hope to pick up a few specific colors but am running out of room to add many more. I would love to visit Port Meirion someday. What a lovely selection of Iris, they are such a wonderful family with so many different colours. I have managed to find an iris for every situation in the garden, I don’t think any other plant can do that. Some like water, some like a bog, some like the woodland, some like the free draining grit of the alpine scree and the others love the sunshine! Love your Port Merion vase, it is quite a while since I visited and it really is an amazing place, often used for filming TV series, the last time we were there, they were filming Batman and Robin!! Pauline, that’s hilarious to think of Batman and Robin and beautiful ceramics together. I am just realizing how versatile irises can be. The Japanese Roof Iris for example equally likes sun or shade in my garden, no complaints. Your Fenton glass vase is very pretty Susie and the vase your sisters brought you back from Scotland really lovely too. I have lots of Iris Sibirica here, most are tight buds and just a few that have opened today. Thank you Julie. I have enjoyed using these special vases. 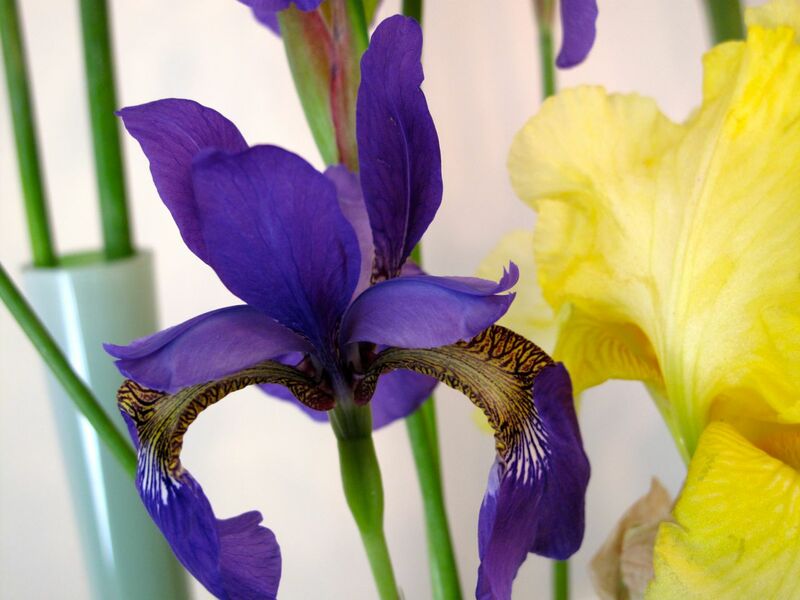 Enjoy your Iris Sibirica–they’re very striking, I think. Are yours blue also? Yes they are blue, they divide up well, so make a good plant to pass a long. I also really like the seed heads long after the flowers have faded. Oh yes, the seedpods–something nice to look forward to. 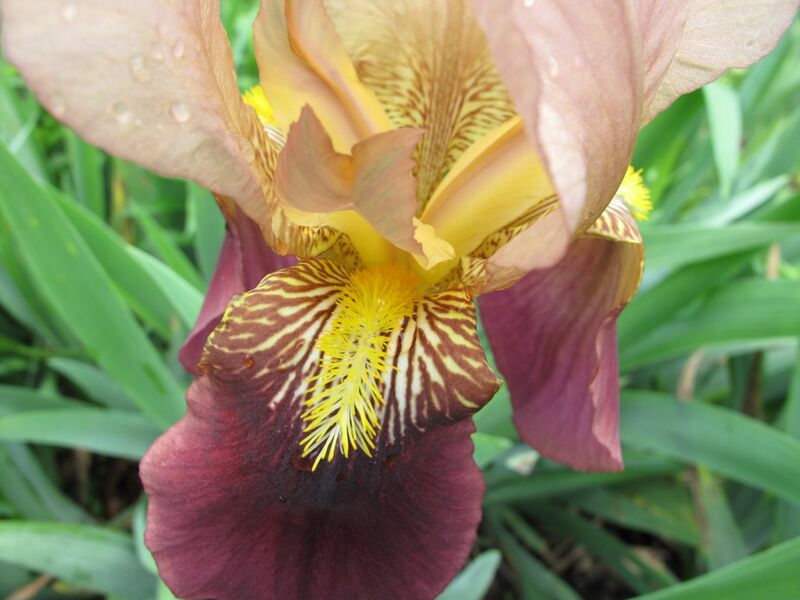 Beautiful photos, and you really have some nice iris this year. I love that roof iris, it’s the one with the darker blue speckles, right? Also love the iris pastel, from the part that’s visible it really looks like a great piece of art to have there hanging. Thanks Frank. 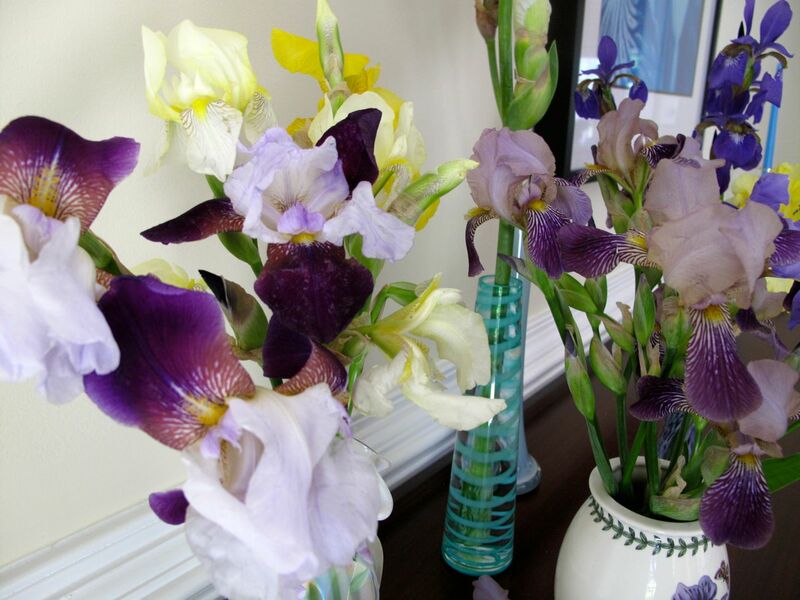 Yes there are 2 roof iris blossoms shown–in the first photo, they’re both in the far right vase in the front. They don’t grow very tall. The pastel drawing is really very nicely done by my son-in-law, especially for this house. 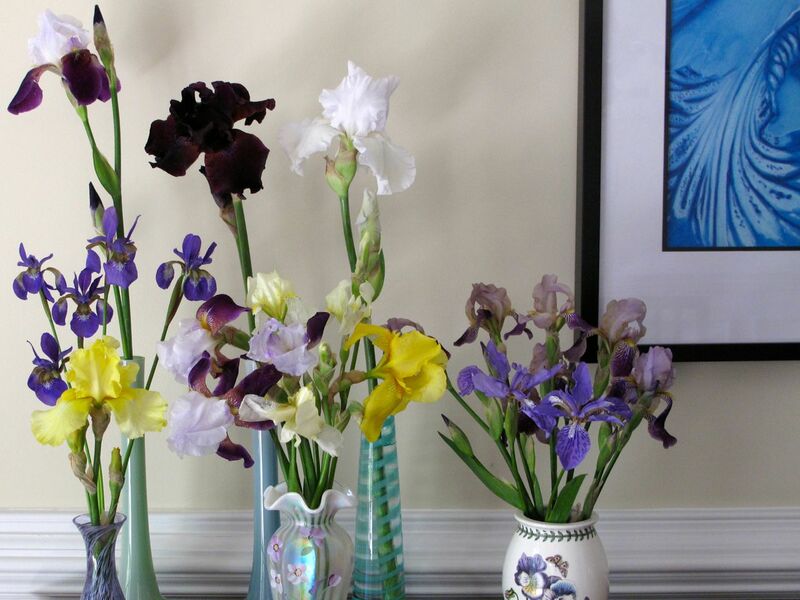 Gorgeous irises and vases. I have some roof irises but they have not bloomed yet. Thank you. I learned this year they really were grown (maybe still are) on top of roofs! I was told that also, they would grow in the thatch of roofs in rural Japan. You are connoisseur of iris. Thanks for the inspiring example. Beautiful assortment of irises. Wonderful stories and memories to go with the as well. I’m hoping my Siberian irises will bloom this year. They haven’t been too happy with their new location. Thank you Stephi. I do hope your Siberian irises will put on a good show. I moved a few of mine last year as the original location was overcrowded. The irises have not been particularly interesting indoors this week as they require a lot of deadheading as the buds fade. But I enjoyed pulling together my irises for this week’s vase project. I always learn something about the flowers this way. Gorgeous display, love your irises variety. Thanks, this is a good year for the irises.